The Non-Metaphorical Journey. The nuts and bolts of traveling back and forth from Austin to San Antonio. In the last twenty years I imagine the population in central Texas, from San Antonio to Waco, with Austin in the middle, has doubled. 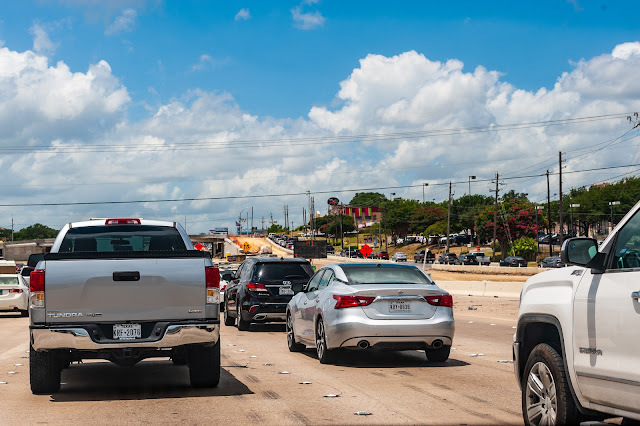 The main highway (IH-35) between the central United States and Mexico (as well as huge swaths of south Texas agricultural centers) has not doubled in size, not doubled in lanes; mostly not kept pace at all with the endless, relentless flow of traffic. 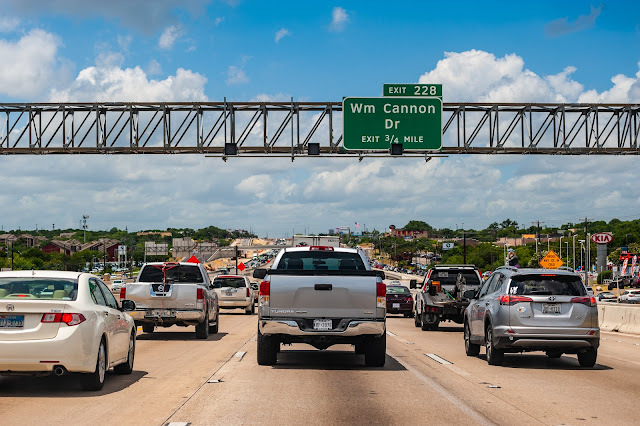 This makes commuting back and forth, or visiting regularly, between Austin and San Antonio, an unpredictable nightmare. What used to be a one hour and five minute journey is now, typically an hour and forty minutes. Each stalled car on the roadside adds an additional five minutes. Every wreck requiring police or ambulance attention can add 20 or 30 minutes of white knuckle driving to the tally. It's a modern sort of torture that reminds those of us who remember the wide, almost car-less expanse of highway back in the 1970's and 1980's that, where infrastructure is concerned, our country may have been comfortably first world then but we have, through neglect and lack of planning, demoted our public road resources to a decidedly third world standard that is neither safe nor convenient. Sadly, it's still the quickest way to get between the two cities for everyone without access to their own plane or helicopter. So, yesterday, we added over an hour to the journey. There were three major wrecks along the route. Mostly caused, I would bet, by inattentive drivers trying to multi-task via text or phone, which is always bad when combined with another subset of drivers who believe it is their manifest destiny to drive their pick-up trucks at 90 MPH, five feet from the bumper of the person in front of them. After many roundtrips this year, taken at all different times of the day and night, I've resigned myself to this painful process and my intent is not speed but my own personal safety. After a nice visit with my father yesterday I headed home but instead of tossing the dice and taking another ride up IH-35 I took the longer and slower route home, heading up HWY 281 north. It's the back way. Is it dangerous to take photos out of the windshield of one's car? HWY 281 is not yet subject to full stop traffic jams. 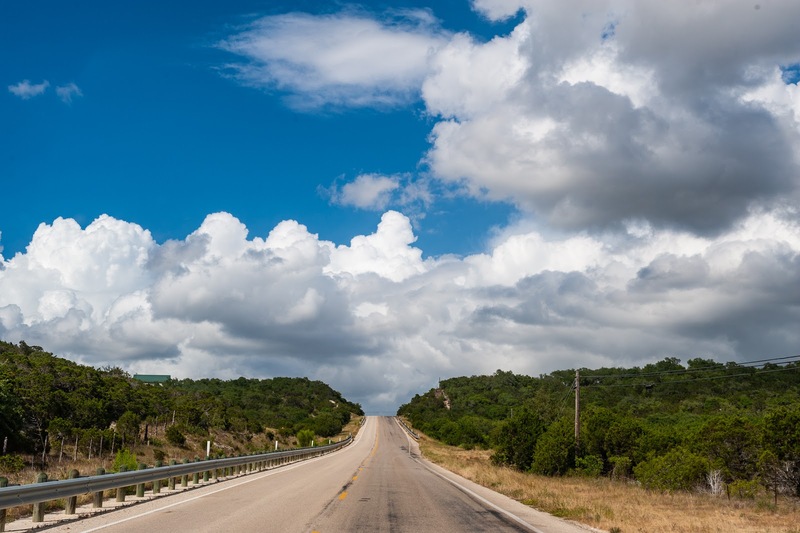 Parts of that highway offer beautiful views of an undeveloped portion of the Texas Hill Country. There are a series of mini-mountains (maxi-hills?) that are referred to as, "The Devil's Backbone." Named because the early Texans with horse drawn wagons found the topology nearly impossible to transit. Because I had no pressing engagements I went further off the main grid by turning right at Blanco, Texas and taking the Henley Loop over to HWY 290. 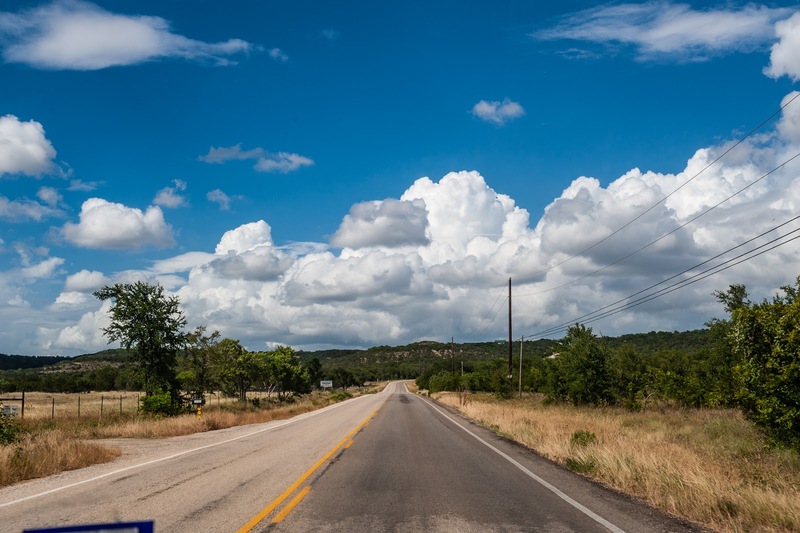 I don't know the real name of this two lane blacktop but I call it the Henley Loop because Henley, Texas is on the route to HWY 290. Whatever it's called it was largely deserted at 3:30pm in the afternoon and made for a much different, much happier journey home. 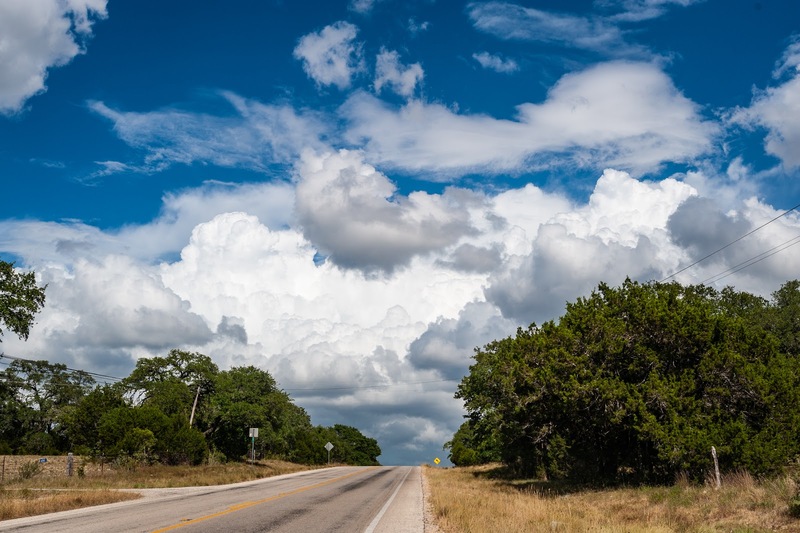 From time to time I was so enchanted with the big sky of central Texas that I would pull of the road to click a frame or two of the landscape meshing with a dramatic skyscape. I had only my "car" camera. It's a Nikon D700 bought expressly to keep handy in the car and it generally rides along with a battered and crusty Nikon 35-70mm f3.5 manual focus lens that I've come to trust for sharpness and an almost Technicolor rendering of reality. I kept it close by, on the passenger's seat, set at ISO 200, with the aperture at f8, and left it to the camera to calculate a good exposure. With the distance scale set between 30 feet and infinity I didn't bother with focusing. At the time I wished I'd brought along a polarizing filter but when I went to post process the raw files today I realized that adding polarization to the mix would have been over the top. Too much. I would never suggest anyone shoot from a moving car.....if they are the active driver. But I break the rules when I am at a stop sign and there's no other car for miles around. 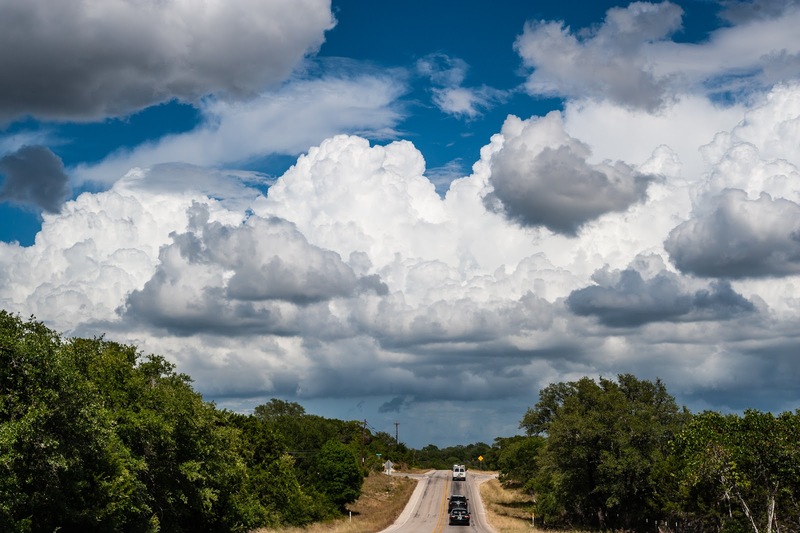 It's wonderful to see that there are still parts of Texas not completely ruined by the pervasive car culture. I'm pulling out the maps to try and discover new routes to San Antonio --- trading speed for calmness and appreciation of our remaining wide open spaces. Happy Father's Day. A long journey of unconditional love and support. I've spent a lot of time with my dad in the last six months. When my mom passed away he lost his best friend and his #1 care provider. He was diagnosed with vascular dementia a few years back but he continued to function adequately with my mother's constant help. At the beginning of the year the responsibility fell to me. Yesterday I marked my 38th round trip this year to San Antonio. I went down to see how he was doing with his re-entry into his memory care facility after our stay in the hospital the week before. My sister was down for the entire week in between and helped him get back into the swing of things. The two of them had always played Scrabble together and they had many matches this past week. My sister (who, among other talents, has a degree in English from UT Austin) was soundly beaten by dad in several of the games. 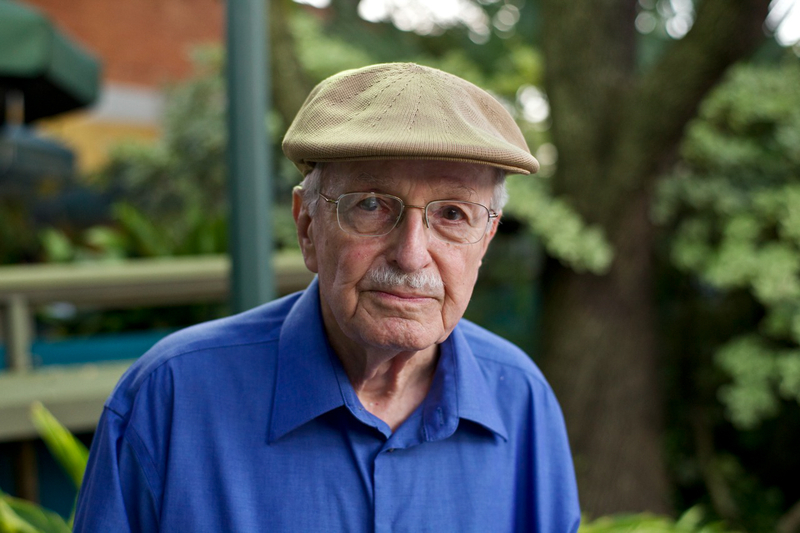 While my father has lost some of his memory, and had other parts of it scrambled, he is still verbally eloquent and an avid reader and writer. At 90 years old my father scorns things like walkers and wheel chairs and insists on getting places under his own steam, with the use of a cane I bought him many years ago. When I visit him these days I bring him the Sunday New York Times and a small bag of his favorite candy; Hershey's Milk Chocolate Kisses. When I pick up and recycle the previous week's NYT I'm always impressed to see that he has worked diligently and well to finish the Sunday crossword puzzle. We have lunch together at his favorite table, along with several of his regular friends. They are all 90 or older. Sometimes, in private, my father will remark, "I don't know how I ended up here...some of these people are really quite old." After lunch I brief him on the activities of the week and of his current financial condition. He craves the news. His father was a banker and he can't help his need to keep track of his money and comment on the performance of his "staff" (meaning me of course). My dad has always been there for me and my brother and sister. My parents were more or less model parents. They never could rationalize the cost of buying a color television or getting cable but were more than happy to put three kids through college and graduate schools without thinking twice. My dad never missed an early morning of getting up and driving me to swim practice before school, and at every family crisis my parents showed up, check book in hand, ready and able to beat back hysteria and desperation (which thankfully for all involved were very rare occurrences). I went down to San Antonio yesterday not out of a sense of duty but because I wanted to stay our course and maintain a recent routine which seems to have made him satisfied with his new home and mostly happy. His face lights up when I walk in his door. My heart swells a bit when we hug. We are so frank and honest with each other now. There's so much less in the way. My dad made a good recovery from his recent cardiac scare. His private apartment is beautifully appointed and filled with portraits of family and friends. The staff has given up trying to introduce my father to some of the mindless activities of the facility and we've agreed to let him do the things he has always done; sit in a comfortable chair in his room, listen to classical music on his sound system and read books about world history. Even with the handicap of dementia he probably knows more about American history than 99.9 percent of this country's population. He's always been a person who cherishes his privacy and solitude. He's always been an academic. It's fun to see him continue on his own terms. He's a great role model for me and my siblings. Happy Fathers Day to all of you fathers out there who have done your work, raised great kids and dealt, for better or worse, with all the curve balls that come along with the joy and responsibility of moving people from potential to success.